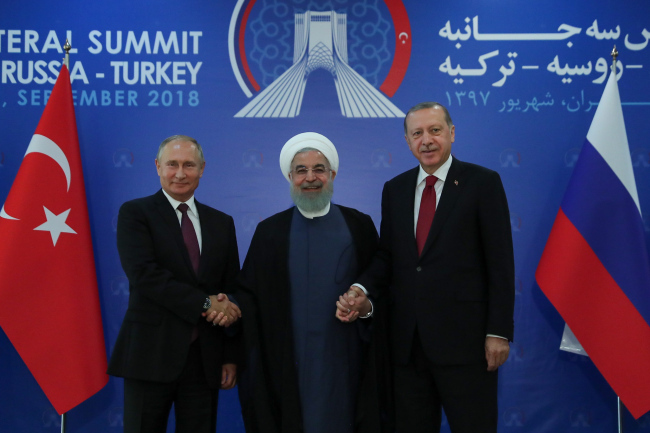 TEHRAN -- The presidents of Iran, Russia and Turkey met Friday to discuss the future of Syria as a bloody military operation looms in the last rebel-held area of the war-ravaged nation, urging militants to lay down their weapons. Turkish President Recep Tayyip Erdogan called for a cease-fire and an end to airstrikes in the northwestern province of Idlib, something that wasn’t immediately accepted by Russian President Vladimir Putin and Iranian President Hassan Rouhani. Instead, Putin warned militants in Idlib planned ``provocations,’’ possibly including chemical weapons. The Syrian government has been repeatedly accused of using chemical weapons in the long conflict. For his part, Rouhani demanded an immediate withdrawal by American forces in the country. The U.S. has some 2,000 troops in Syria. He added that ``we have to force the United States to leave,’’ without elaborating. Northwestern Idlib province and surrounding areas are home to about 3 million people -- nearly half of them civilians displaced from other parts of Syria. That also includes an estimated 10,000 hard-core fighters, including al-Qaida-linked militants. ``The least the summit can do is to prevent this military war,’’ he said.